Welcome to my first Wedding Wednesday! I made a list of all the different things I want to tell you about, and if I actually find photos and address one per week, we should be done somewhere around Easter. I’ll try to condense a little. 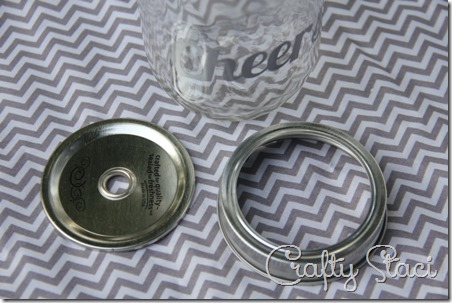 I want to start with one of my favorite and most lengthy projects – the wedding favors. My daughter wanted to feature mason jars, so we decided early on that we’d use them as drinking glasses. From there it morphed into painting them with a little chalkboard paint so guests could write their names on them, to painting the names on with glass paint, to cutting the names from permanent vinyl and adding a lid with a grommet and straw and making them the take-home wedding favors. With about 225 invited guests and extra jars for surprises, it was an ambitious undertaking but one I was happy to take on. Last winter, my husband decided I needed a Silhouette Cameo. I didn’t think I really did. I figured it would be fun to play with once in a while, but would mostly just take up space. Let me tell you, much of what I made for that wedding couldn’t have happened without it. This post is in no way sponsored or endorsed by Silhouette, I’m just here to tell you that I’m a huge fan now. I found the software easy to use, the prices and selection for art very reasonable and the learning curve to get started with the machine wasn’t nearly as bad as I expected. Commercial over, back to our regularly scheduled programming. I set up a template page for the names and just returned to it each time I needed to start a new one. There were many, many pages. I bought grey permanent vinyl on Amazon, which by happy accident ended up looking a little like the glasses were etched. I used cheap, clear vinyl over the top as a transfer medium, then cut all of the names apart. All that was left once that was done was to wipe the jars down with rubbing alcohol and apply the names. 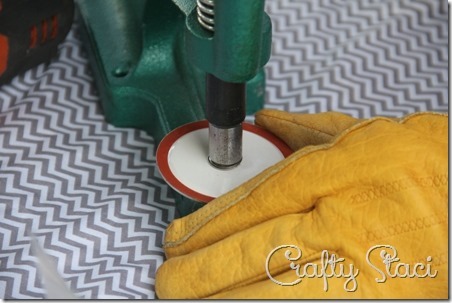 While I was working on the glass, my husband was crafting the lids. After doing a couple by hand, he did a little shopping and found this contraption. It was $65 on Ebay (you can also find them on Amazon) and came with some grommets. When you’re looking at making nearly 20 dozen of these, that cost is so worth it. 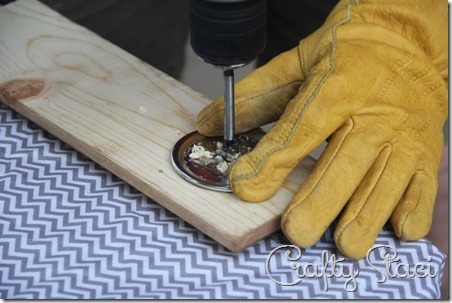 To start, he drilled holes in the center of the lids with a 7/16” drill bit. He ultimately used his drill press because he ended up with smoother holes and it took less time, but a regular drill can work too. He inserted the larger side of a #2 size (a tiny bit shy of 1/2”) grommet into the hole and slipped the smaller side onto the back. And we had lids that straws fit into perfectly. 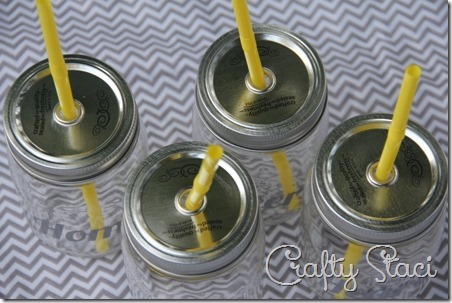 Of course, since the wedding colors were yellow and grey, we searched the world for yellow straws. I couldn’t be happier with the way these turned out. They worked well for holding the tea and lemonade we served, and the lid kept out the pesky bugs. We wanted to make sure guests understood that they could take these home, so I again used my Cameo to make a sign. We just used 1/8” hickory plywood that my husband cut to size, added the lettering, and I found that cute mason jar (with the word Love on it already) in the Silhouette store. I improvised the yellow vinyl straw. These were a huge hit with our guests and a great way to help them find their seats. In fact, we only had one jar left behind at the end of the night!